What is the take away for doing something 40 days? Whether it’s in fasting or in temptation, there’s something here about forty days that should be considered, should be pursued. It’s a whole lot of waiting: more than five weeks of consideration. I wonder what would happen if I waited (prayed, contemplated, meditated) forty days before I initiated a plan or a major decision? At once the Spirit sent him out into the wilderness, and he was in the wilderness forty days, being tempted by Satan. Jesus, full of the Holy Spirit, left the Jordan and was led by the Spirit into the wilderness, where for forty days he was tempted by the devil. There are other scriptural examples of 40 days: the flood (Genesis 7:17); Moses on Mt. Sinai (Exodus 24:18; 34:28; Deuteronomy 9:9); Spies in the Promised Land (Numbers 13:25); Goliath’s challenges (I Samuel 17:16); Elijah’s flight and fast (I Kings 19:18); Jonah warns Nineveh (Jona 3:4); Jesus appeared to the disciples after his resurrection (Acts 1:3). All of these 40 day increments are wrapped up with important events, usually before something major would happen. So, let me put this in perspective (for myself, if nothing else). If I claimed this 40 day waiting period starting today, that would mean on Friday, September 14th, I could begin: I would know whether to go forward or not. If I seriously pursued my quest for those 40 days, I would know. It’s like a promise, I think. Don’t misunderstand me. I get it that this period should be led of the Spirit and yet, I have a feeling. If I laid out my heart’s desire, my plan before God and then repeated my request each day, I believe I would have an answer. I would also have a bit of a struggle along the way. Based on the stories, a truly authentic 40 days is laden with challenges. Satan (or however you want to call that negative voice/power in our lives) tempted Jesus the whole time just like Goliath tempted the Israelites. Goliath mocked them and taunted them: Dare you! Double dare you to come out here and fight me (on his terms of course). Satan does the same thing. The forty day challenge puts the entire experience on God’s terms. Apparently, 40 days are just long enough. They take the person just beyond that point we can do it on our own. Forty days include the extra mile. What do I really want to know? What game-changing decision do I want to contemplate? What would be the best news ever? I am traveling with you, sister. You are not alone. More will be revealed to you, especially when you share your journey. 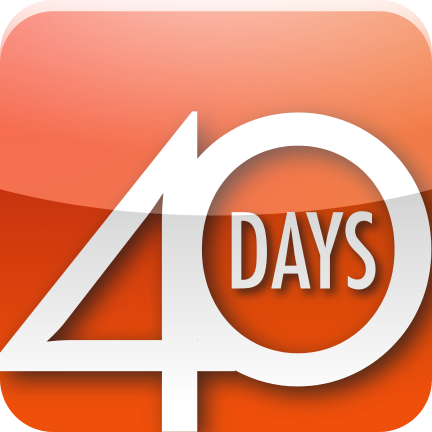 There is something about the 40 days but it is something we are lead into or pushed into, lol. My son, who was 5 at the time, had a horrible accident during a routine tonsillectomy. Oxygen had leaked around his tracheal tube and the cartelizer ignited the oxygen and sent a jet-like fire into his lungs. He was airlifted to “Hope” children’s hospital and two days later, both of his lungs collapsed and his heart rate began to drop. He was resuscitated for 45 minutes. We were told he will not make it and if he does he will not be able to breathe on his own and he will have brain damage, which alsoeant heat never walk or talk again too. I was taunted and tempted by SO many, friends, family, doctors, strangers that suggested this was God’s doing and that I need to come to terms with the fact we may lose him. But I had a peace. The Spirit WAS with me and I just knew God would heal him and that this was going to glorify God and that this wasn’t too hard for God. I did have my weak moments but then I’d, with the help of the spirit, put Satan back in his place. After 21 days in a coma and so many near death moments and rehab, we were told on the 40th day our son can go home. We brought him home on the 42nd day for convenience reasons. Oh, he is 11 now. He can walk, talk, read, sing, love Jesus and breathe on His own. God worked a miracle. No problem :). Thank you for your posts. I love reading your thoughts. May we always glorify God in bad times and good.